The two months that Martin Luther spent in Rome in 1510 arguably changed the world. By his own account he arrived as a naïve young friar, eager to seize salvation for himself and his family by praying to Rome's holy relics. He left horrified by Rome's corruption, doubting conventional wisdom, and convinced that the pope was "worse than the Sultan of Turkey." (He later compared the pope to the antichrist.) Seven years later, most of the ninety-five theses he tacked on the door of the Wittenberg Cathedral attacked practices he had witnessed firsthand in Rome. What happened during that winter in Italy that so changed this devout young man? Read on to find out. 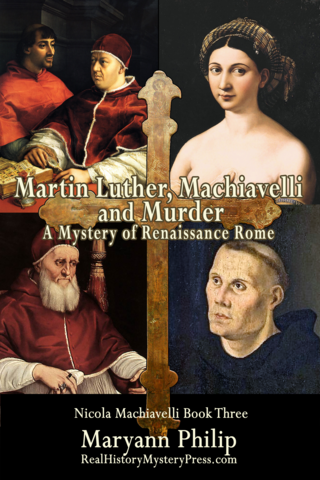 As in earlier Nicola Machiavelli mysteries, historical characters appear only where and when they did in real life, doing what they did in real life, with rare exceptions noted in the Afterword. While the murders that Martin Luther helps solve in this book are fictional, the background murders actually happened. The naked man landed in front of them on the ancient Roman roadway, knees bent as if felled at prayer, hairy buttocks pointed at Heaven in obscene genuflection. He flopped sideways toward the Tiber River and lay at the inner edge of the road, curled on his side, chin tucked against hands clutched as if in supplication. Nicola Machiavelli took a breath to calm her racing heart. The man was so close she could see the dust settling around him. With a strangled cry, Martin Luther rushed forward to cover the man's nakedness with his cloak. "Drunks falling from the sky. The Holy City is Hell. I am in Hell," he shouted in guttural Latin. Skeletally thin in his brown friar's habit, he looked like a lost soul, bending over one of the damned. He touched the shaved spot on the man's tonsured head. "Misericordia. He is a monk." "A cardinal, Frate Martin," Nicola said. "See the ring?" Luther knelt to stare at the enormous gold ring, set with a sapphire and emblazoned with crosses. Then he stared at the man's face. "I have kissed that ring," he gasped. "I pray God to help me––I only just met him. At the monastery where I am staying. He is Cardinal Beccaria. The next pope, everyone said. A very holy man, they told me. I cannot believe this." Luther's naïveté had surprised Nicola when she first met him, earlier that morning. Now, his raw pain sent tears to her eyes. Her mind searched for Latin words she hardly knew. "He may be Cardinal Beccaria but––I'm sorry to tell you, Frate Martin–– he was not a holy man," she said slowly. "He fell from a brothel." Nicola had often hurried past the massive stucco structure, trying to ignore the cries of pleasure that floated over the Tiber River Road from its large second story windows. "A brothel." Luther crossed himself again and looked at his own chest, as if it were a sin even to see the building looming above them. "God has punished him for his sins, then." A woman screamed from a window overhead. Swallowing her reluctance, Nicola bent down to feel the cardinal's neck for a sign of life. It was without pulse, and as cold as the winter's day. "He's not drunk. He's dead," she told Martin Luther, her shocked Latin sounding foreign to her own ears. Moving Luther's cloak, she inspected the wound on the corpse's chest, a stark red triangle against pale, bloodless skin." And God was not punishing his sins. He has been stabbed in the chest." "Stabbed? Murdered? This city. Such evil I never imagined." Luther's face was ashen. Then his eyes widened and he crossed himself again. "I must guide his soul towards Heaven, may God help me." Kneeling on the ancient paving stones, he placed a hand on the corpse's forehead and began reciting the last rites for the dead, with the same sincerity Nicola had admired when she watched him recite Mass. The instant he began speaking to God, he seemed lost to the world. The screaming woman had moved to the brothel's interior, which muffled her agonized shouts. Nicola turned to watch the whores and their customers stumbling from the back of the whorehouse, in apparent response to the screaming. Several prostitutes fled first, their painted faces glancing back at the body as they called to one another in alarm. A papal Swiss Guard whom Nicola recognized followed, buckling on his sword, unmistakable in his colorful striped uniform. Then several merchants emerged and scrambled down the embankment to the river, shouting "Cast off!" to the boatmen moored to the whorehouse dock. The merchants were followed by two raggedly-dressed maidservants. Behind them hurried several more whores in gaudy silks and hooded cloaks. One of them was shoved aside by a Teutonic Knight, followed by a Knight of Saint John, judging from the crosses on their cloaks. Next came a laundress with pendulous breasts carrying a large reed basket of crumpled linens, two priests, and a heavyset matron with a garishly painted face, a colorful turban, and billowing yellow cloak. She stared at the body, mouth agape, then ran after the whores, shouting for them to return. Nicola memorized what she saw, wishing she had a better view of the faces. All those fleeing disappeared into the first opening leading from the Tiber River Road to the tangle of alleys around the Campo de' Fiori. Behind Nicola, a crowd was gathering around the body. Another priest bent to anoint the dead man's head, then knelt to join Martin Luther in reciting the rite of extreme unction. The barghelli would surely arrive soon. But could they be trusted to look for what was missing? Unlikely, Nicola decided. Was she about to involve herself in a suspicious death again? Her "Aunt" Caterina would berate her for it, if she found out. But Caterina was in Bologna. On the other hand, Francesco, to whom they both owed favors, would thank her. She decided to risk it. When she thought the whorehouse was empty, Nicola ducked through its open back door. . . . .